Homework is universally loathed, isn’t it? 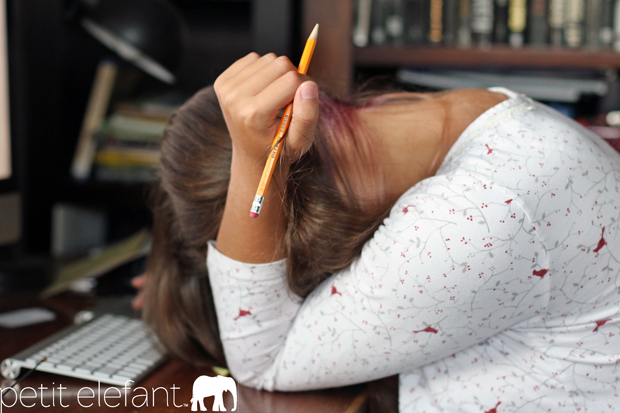 The word itself is rough enough, but when you add the actual implications of a load of very real school work to do at home, homework can be just a little bit too much to handle. In fact, since school started for my kids a few weeks ago, our nights have been full to the brim with school assignments and hours of homework. And the thing is, my kids aren’t the only ones dreading school nights. My husband and I are up to our necks in explaining math concepts we haven’t practiced for 20+ years, on top of physics, spelling, book reports, you name it. We’re all tired. All of us loathe the after-dinner routine of sitting down at the kitchen counter or the computer to hammer out several hours of hair-pulling assignments, most of which the grownups in the room don’t know how to explain. So a few weeks ago I put a call out to friends: how is everyone else handling the homework slam? How are all the other parents of the world explaining math to their kids? It’s all totally different than it was when I was a kid and it’s stressing me out. We’re all overwhelmed and super grumpy about the homework life. I got a lot of good ideas back from friends, and they all included tutoring. The trick is, our schedules are so slammed between my son’s commitment to a competitive swim team, and my daughter’s jam-packed list of extracurriculars. A traditional tutoring center just doesn’t work for us. Our schedule is weird and crowded and never predictable, so even hiring a one-on-one tutor is tricky. BUT! I have found a solution for my high school daughter. There’s an online tutoring website called Chegg Tutors. Have you heard of it? I hadn’t, but the internet is full of wonderful, and online tutoring exists! It’s marvelous. Here’s what Chegg Tutors is: an online tutoring platform, available 24/7 with different tutors from across the globe, at the ready to help with almost any subject you could possibly be taking in school. The tutors are waiting to help, college kids and graduates who’ve passed a screening to measure their tutoring capabilities + general knowledge. So when you get to the HEADDESK part of your school day, (which we seem to reach every single day) hang on! There’s help, and the help is awesome. There’s a whiteboard on the Chegg Tutors platform where complicated problems can be drawn out and explained a variety of ways. If you love one particular tutor, you can schedule time to meet with him or her. If you need on-the-fly help from time to time, that’s cool too. It’s all available. When my daughter came home from a day at high school this week, totally overwhelmed and stressed about her math and physics homework, she decided to give the one on one tutoring a try. 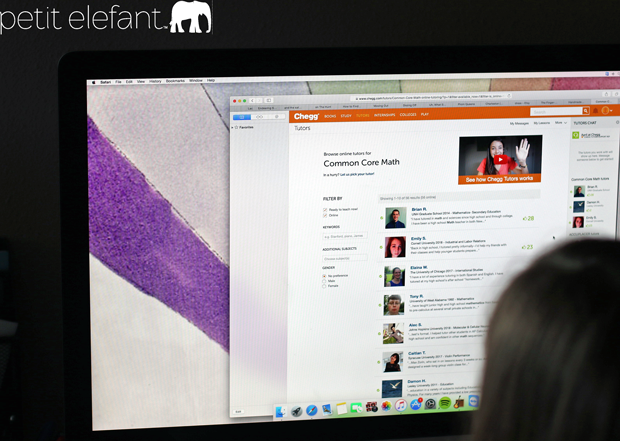 She chose a couple of geometry problems, math proofs that were frustrating her to no end, and logged into Chegg Tutors. Immediately 18 tutors popped up as available to help, (at 8 p.m. on a school night where we would’ve been otherwise very stressed and up the proverbial creek) so she poked around at their profiles for a minute and quickly chose a tutor. As my daughter and the tutor were setting up the technology end of the tutoring session, they introduced themselves to one another, and we discovered that Sofie’s chosen tutor was a Stanford University graduate with an impressive double major in the sciences with an extensive background in tutoring. Well qualified to help with 10th Geometry and physics. The tutoring session lasted about an hour, where Sofie and the tutor used a live video chat and “white board” to draw out the problem and explain the different ways to solve it. The tutor was patient and kind, and super knowledgeable about different ways to approach explaining it until she found a method that worked for Sofie. We went from stressed out and ready to scream to a chill, ‘OK I’ve got this‘ all in under an hour. At the end I asked Sofie if she’d use the service again and she said, ‘ABSOLUTELY, it was lovely.’ So. There you go. The lovely people at Chegg Tutors are offering new users a free trial to see if it works for your life. There’s only winning here, guys. 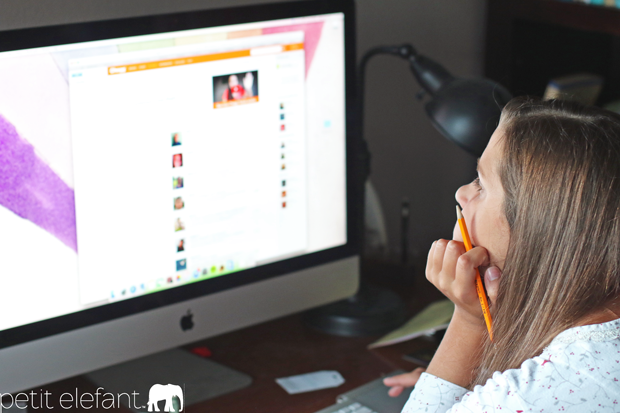 Sign up using this special link just for Petit Elefant peeps and get a free trial. I’d love to hear what you’re doing or have done with the nightly homework crisis. Seriously, it’s my whole life right now and I don’t want it to be. We are only dealing with 6th grade homework so it is minimal compared to high school. A couple ways we are dealing with it though is to limit social media distractions and flat out no video games or you tube on school nights. Her focus as a child first and foremost is as a student. We are in the prime spot to really establish good habits with organization and learning. If she needs help with any homework I am of course the first line of defense, then Google. Then if there is still an issue she can go into school up to an hour early to ask the teacher directly. I will definitely keep this tutoring program in mind though! Common Core math is a beast! Ug, Common Core! Is there a parent alive who’s happy about it? I have yet to meet one. You’re doing all awesome things to create good homework / work patterns! It takes a lot of parent involvement, go you!